In the grand scheme of things — certainly from the perspective of any astronomer who doesn’t make a living studying Solar System science — planets are insignificant specks. They’re tiny. Yet we keep finding more and more of the bloody things every year. The first extrasolar planet orbiting another star (or exoplanet, as they will be referred to from here on) was discovered in 1992. When I was learning about this stuff during my undergraduate degree in 2003, we’d bumped the discovered number up to just over a hundred. Today, if Wikipedia is to be believed, the number of known exoplanets stands at 725. Seven-two-five, despite the vast difficulties inherent in finding these tiny dust motes in a galaxy of comparative colossi. 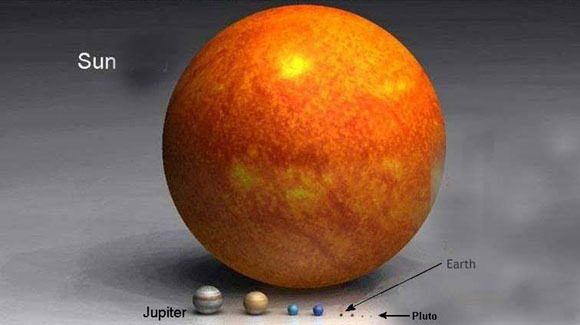 When you think about it you might wonder how the hell we’d found even one exoplanet, let alone seven hundred. Good thing you have me here to tell you all about it. Any astronomer who wants to discover a new exoplanet and name it after his cat has several hurdles to overcome; not least of which is that the IAU are killjoys who won’t tolerate a planet called Mrs Fluffingham even if it is several dozen light years away. Other stars appear to us as tiny points of light. If you used a really powerful telescope to beef up the magnification several thousand times this tiny point of light would resolve itself into… a tiny point of light. Interstellar distances are so vast that stars will always appear as points of light to us; we’re never going to be able to resolve them as objects and observe fine detail as long as we’re stuck here on Earth. That we see them at all is merely a happy byproduct of every star being a raging nuclear inferno that throws out billions of photons every second. A very few of these photons, after spending many, many years whizzing through space, will happen to enter the objective lens of a telescope – or even your naked eye – which is enough for you to perceive a tiny point of light, but nowhere near enough to make out anything more. So if this is the case for stars, which are a) really sodding big and b) natural light sources, how on Earth (har) do we find planets? It’s certainly not through the conventional methods used to locate the other seven in our Solar System, which helpfully reflect the light emitted by the Sun and appear to us as distinct discs. Extrasolar planets have about one-millionth the brightness of their parent star, and finding this preposterously faint wisp of light is further complicated by the fact that it’s sitting right next to a light source one million times brighter – it tends to get lost in the glare of the star. That’s not to say it can’t be done; in some cases we can “block” the light from the star (basically phase-shifting the image so that the star is subtracted from it while leaving everything else intact) allowing us to directly view the planet, but this is really goddamn hard and a major technical challenge, not to mention only being possible if you’re looking for a planet that’s really big, emitting a lot of infra-red radiation and orbiting far enough out from its parent star that it can be viewed as a separate object. Directly viewing an extrasolar planet is pretty much out of the question, then. Fortunately astronomers are very ingenious people who aren’t going to let a little thing like not being able to actually look at the planet get them down, and so several ingenious methods have been developed for indirectly detecting an extrasolar planet over the last twenty years. I’ll be talking about the three most successful ones. The first is radial velocity measurements. Stars exert gravitational force on planets which causes the planet to orbit the star, but what people often forget is that all gravitational effects are mutual and that the planet is also exerting a gravitational force on the star. This means the centre of mass of the star-planet system won’t be at the centre of the star but will instead be offset from it by a small distance, causing the star to orbit around this point and move back and forth relative to the Earth. This movement Doppler-shifts the light emitted from the star in exactly the same way as stellar redshifts; when the star is moving towards us the wavelength of the light will be shorter, and when it is moving away from us the wavelength will be longer. By looking at the wavelength of a star’s light as it changes over time we can measure the star’s radial velocity, and so determine whether or not the star possesses an orbiting planet. It’s a bit imprecise for determining what the exoplanet is like – since a smaller planet orbiting close in will produce the same radial velocity as a bigger planet orbiting further out – but it’s an excellent method of finding out whether or not it’s there in the first place, with the vast majority of exoplanet detections being attributable to the radial velocity method. Then there’s the transit method. If a planet is orbiting so that it passes directly between the Earth and the star, the planet will block out some of the star’s light. Astronomers study what is called the star’s light curve; essentially a big graph of the brightness of the star as it varies over time. If they see a small temporary dip in the light curve, and that dip repeats itself at periodic intervals, it’s a fairly good bet that’s it’s being caused by an exoplanet. The drawback to this method is that it’s only applicable in very specific situations; you need a big planet orbiting close in to the star so that it’ll block out a lot of light, and you also need the exoplanet to have this very specific orbit which places it on a direct line between the Earth and the parent star, which is thought to be the case for only 10% of exoplanets. However, there is also an advantage in that we can use spectroscopy to examine how the starlight changes as it passes through the planet’s atmosphere – whenever you see a headline about a newly discovered exoplanet with a vaguely Earth-like atmosphere, chances are it was discovered using the transit method. Lastly there’s gravitational microlensing. This isn’t that great in comparison to transits and radial velocity measurements, but it’s notched up thirteen detections so it does deserve a mention. If light emitted by a star passes close to another star on its way to the Earth, the gravitational field of the second star will “bend” the light from the first star causing a lensing effect which effectively magnifies the light. Any exoplanet orbiting the lensing star will contribute its own gravity to the lensing effect causing it to change over time as the planet moves around the star. If astronomers are vigilant and lucky – and they have to be considering that stars and planets are constantly moving relative to each other making these events very hard to catch – they can observe this change in the lensing star’s magnification and infer the existence of the planet. Most the exoplanets so far discovered have been of the “hot Jupiter” type; very large gas giants orbiting their parent stars at about the same distance as Mercury orbits the Sun. 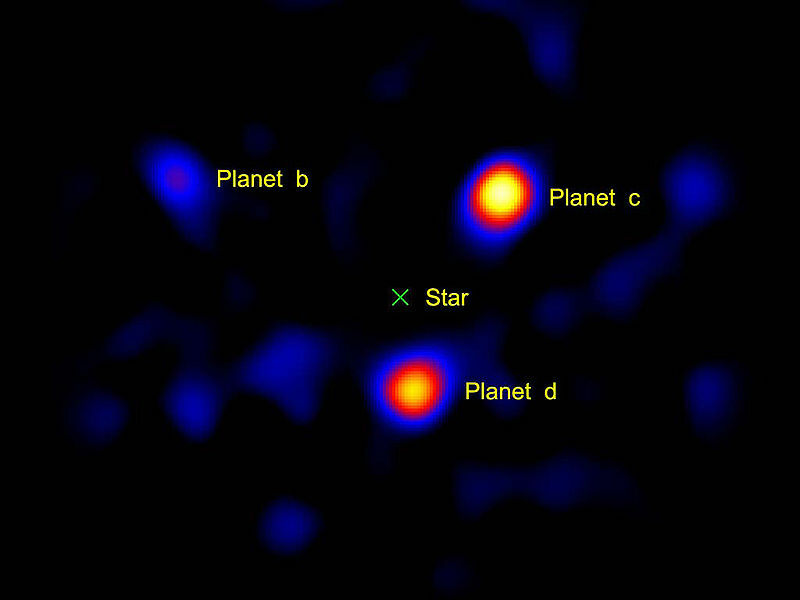 This isn’t because the majority of exoplanets are genuinely of this type, but instead reflects a bias in the detection methods: all three methods described above are heavily dependent on the exoplanet in question having a large mass, and two of them are also more effective if the exoplanet is orbiting close to its parent star. While the simple existence of the hot Jupiters caused scientists to reassess the way they thought planets formed and evolved over time (as ever, I may write more on that later), a major goal of the exoplanet search is to refine the detection methods so that they’re sensitive enough to reliably detect Earth-like planets orbiting at Earth-like distances, for the obvious reason that these are the places most likely to support life of some kind. This made the detection of Kepler 22-b a big step forward – it was small enough that it was unlikely to be a gas giant, and it was orbiting in what is called the habitable zone1 of Kepler 22 thus qualifying it as the first confirmed exoplanet discovery in this category. But why are we so interested in finding Earth-like planets? It’s not like we can ever actually visit these places in any meaningful way2 (at least not without some physics-breaking discovery that allows FTL travel) so why the obsession with finding habitable worlds? Well, it’s mainly to put some kind of constraint on how many of those worlds are out there. There’s something called the Drake equation which describes all the factors that go into an intelligent civilization arising on a certain planet — does the star have planets, are those planets in the habitable zone, do those planets go on to develop life etc. etc. – but it hits the tiny snag that we have absolutely no idea what values we should assign to these factors because we’re currently working with exactly one example of a habitable planet that supports life: the Earth. With more examples of habitable worlds we can start to assign some vaguely meaningful values to the first few terms of the equation and start narrowing down exactly what the chances are of the Milky Way hosting extraterrestrial life. As this is probably the only way we’ll ever figure that out, it’s very much worth doing. Exactly what constitutes a habitable zone is a matter of some debate. The straight definition is the zone where temperature and pressure conditions are such that liquid water can exist on a planet’s surface, and so this varies with the temperature of the star; hot stars have habitable zones which are further out, while smaller, dimmer stars would have habitable zones much closer in. However, astrobiologists call into question the prequisite that liquid water has to exist on the surface of a planet as necessary for life to exist, citing the example of Europa as a planet-sized object with a subsurface ocean of liquid water that may yet turn out to support microbial life of some kind. And of course this isn’t even getting into the “life, but not as we know it” argument. By “meaningful” I mean “Seeing a probe we launched arrive at another star within our lifetimes”. If we were willing to wait a while – say, a couple of hundred years – then interstellar travel would be easily doable the old-fashioned way. This gives rise to all sorts of wacky concepts like O’Neill cylinders, generation ships and von Neumann probes, the last of which actually come into play as part of the argument for why intelligent life likely doesn’t exist anywhere else in the galaxy. Huh, 1992? I always figured other planets had been discovered as early as the ones in our solar system and we were up to thousands of discoveries. I think I’ve just assumed that finding planets was just like finding stars but you used better telescopes. i.e. you could actually see the exoplanets. So does this mean that nobody has actually laid eyes on a planet outside our own solar system and we don’t really know what they look like other than gas-giant, earth-like, etc? Could we ever do that from Earth or is it impossible even with future technologies? Will we ever see a picture of an exoplanet without sending a probe? P.S. – Large telescope arrays like the VLT can analyse exoplanets in other ways, like spectroscopy; http://www.eso.org/public/news/eso1002/ is a news story about it getting the first direct light spectrum emitted from an exoplanet, which will tell us about its composition via chemical absorption lines. You see that coronagraph of the three planets b, c and d? That’s just about the best direct image we’ve got. No, because even if a planet existed which could be imaged telescope technology is ultimately limited by certain hard physical laws governing their resolution – see http://en.wikipedia.org/wiki/Angular_resolution – that mean building a telescope ( or even a telescope network – see http://en.wikipedia.org/wiki/Astronomical_interferometer ) with the required focal length to resolve an extrasolar planet is practically impossible. For example, this – http://en.wikipedia.org/wiki/File:Nebula_around_Betelgeuse.jpg – is the sort of resolution we get out of the Very Large Telescope array. The black disc is Betelgeuse, which is a star roughly twenty times the size of the Sun. Any planet would still show up as a pinprick on this image. Probably not. You have to bear in mind that there’s lots of stuff *in our own solar system* we haven’t been able to directly image in any meaningful way yet; we won’t have a decent picture of Pluto until the New Horizons probe gets there in 2014. Not sure if that’s a tautology or if your reading audience spans more than I thought but either way I like it.